Discover Italy’s vivid ancient history on a full-day coach and walking tour of Pompeii and Naples with a local guide. 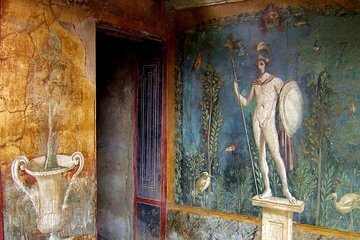 Hear stories about the people who lived in the shadow of Mount Vesuvius as you travel to the archeological site by luxury coach, then explore the streets, homes and public places that were preserved beneath a thick layer of ash. Visit a coral jewelry workshop and store, see Naples’ historic downtown on foot and take in the waterfront by coach before finishing your tour in central Naples. Pompeii admission excluded. Good tour. Very informative. Group was too big to get personalised service. Maybe times for the tour should be more staggered as there are a lot of people visiting. Worth doing tour as you jump the queues. Make sure you wear comfortable clothing and shoes as it is normally very warm and path is very uneven. Just OK compared to our other tours in Italy. Guide was knowledgeable, but felt rushed as she was translating in 3 different languages. We had booked an " English speaking tour," but we spent a good amount of time waiting for other translations, or for guide to take phone calls from office. Seemed unorganized.